Coca-Cola is to buy the Costa Coffee chain from UK leisure group Whitbread, in a £3.9bn ($5,1bn) deal that sets up the world’s biggest beverage maker to take on Starbucks, Nestlé and JAB Holdings in the global battle for coffee sales. Costa is the second-largest coffee shop globally, with almost 4,000 retail outlets. While Costa does not compete in the US market, it is the UK’s leading coffee chain and operates several hundred outlets in China. 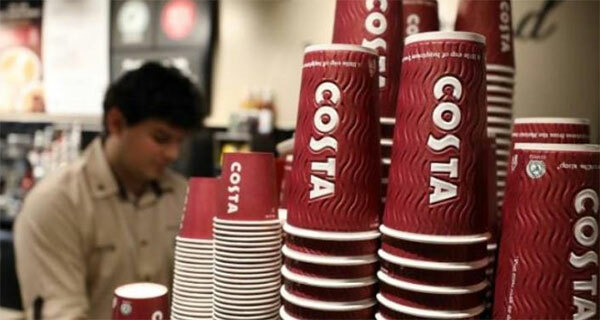 FTSE 100 group Whitbread had previously announced it would spin off Costa, under pressure from activist investors. American hedge fund, Elliott Management, took a roughly 10% stake and argued for splitting the business, the BBC reports. As of April, Whitbread was planning to slowly spin off Costa. Then Coca-Cola came along. Shares in Whitbread jumped 18 per cent after it announced the deal today. For Coca-Cola, the transaction represents a leap into the global coffee market, where it has little presence. Coca-Cola’s earnings have declined over the last five years from almost $14-billion (EBITDA) in 2013 to just under $9-billion in 2017, but it still dwarfs Costa, which generated $312-million in EBITDA in its last fiscal year. The decline parallels a longer decline in soft drink consumption in the US. The soft drink giant is redefining its portfolio to include less sugary and more profitable drinks including water, alcohol, and now hot drinks. While Coca-Cola does serve ready-made coffee from vending machines in Japan, it does not have a hot-drink category. Paying about £1-billion pounds more than some analysts had expected, Coke will use its distribution network to supercharge Costa’s expansion as it chases current coffee chain market leader Starbucks and its almost 29,000 stores across 77 markets. Quincey added that Costa offered an attractive global supply chain, taking coffee beans from roasting through to customers in multiple formats. “On the one hand, £3.9-billion is an undeniably rich valuation and likely far better than Costa could achieve as an independently-listed company, valuing its earnings higher than those of the mighty Starbucks,” says equity analyst Nicholas Hyett of Hargreaves Lansdown, when reporting to the BBC. The move marks the end of Whitbread’s 23-year ownership of Costa, which the group bought for £19m when it had just 39 shops. It now has more than 2,400 shops in the UK and 1,400 in more than 30 international markets, as well as operating a self-serve business. Costa Coffee has sought international expansion in recent years, particularly in China, as it looked to offset declining sales on British high streets. The deal is subject to stockholder and antitrust regulatory approvals, and Coca-Cola expects it to close in mid-2019. Coffee has been one of the frothiest markets for mergers and acquisitions activity over the past year, as competition between Swiss group Nestlé and JAB Holdings — the private investment group that manages the wealth of Germany’s billionaire Reimann family — has heated up. Nestlé’s deals include taking a majority stake in hipster roastery, Blue Bottle, and acquiring rights to sell Starbucks products, while JAB earlier this year struck a deal to combine its Keurig Green Mountain coffee business with soft drinks producer Dr Pepper Snapple.